In stock -This product will ship today if ordered within the next 8 hours and 21 minutes. Garlic is a member of the onion (Allium) family, and is used (in fresh or dried form) as a source of characteristic sulphur containing chemical compounds (e.g. allicin, which is responsible for the odour of garlic). Some of these compounds are present in garlic in a latent form, which are activated when garlic cloves are crushed or digested. 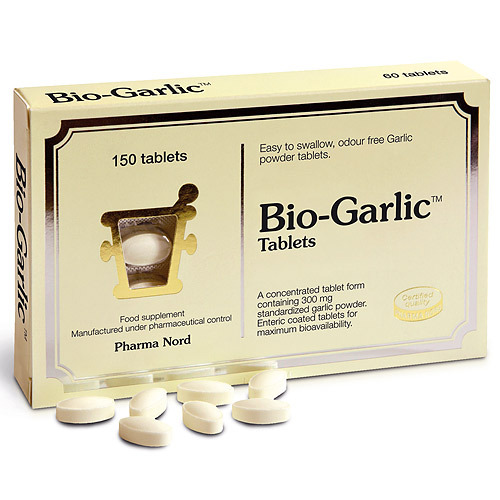 Bio-Garlic is a formulation containing garlic powder dried in a special way to preserve the activity of these latent chemical compounds (particularly alliin and allinase). 1 tablet to be taken per day or as professionally directed. Caution should be taken by those taking anticoagulant or anti-hypertensive medications. Garlic is generally well tolerated with mild gastrointestinal disturbance or skin rash being occasionally reported. 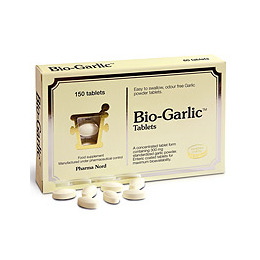 Below are reviews of Pharma Nord Bio-Garlic - 150 Tablets by bodykind customers. If you have tried this product we'd love to hear what you think so please leave a review. We like this product because after three or more years we haven't suffered any colds, we are 75yrs. The properties of garlic have been known for centuries. Garlic is a member of the onion (Allium) family.